In Australia, the 6G series V6 debuted in the 1988 Pajero 4 x 4. Upmarket versions of the ’88 Pajero came powered by a 6G72 engine that displaces three litres thanks to a 91.1mm bore and 76mm stroke. The block is cast iron while the two-valve-per-cylinder SOHC heads are made from aluminium. Multi-point EFI – ‘ECI MULTI’ - is also employed. In standard form, this engine puts out a pretty mild 105kW but with a strong spread of torque. A five-speed manual and four-speed auto is available. In 1993, the second generation Magna and Verada also adopted 6G power. These engines are fundamentally the same as fitted to the Pajero except they’re tuned to deliver 124kW at 5500 rpm and 235Nm at 4000 rpm. These engines are also engineered for transverse mounting and front-wheel-drive through a five-speed manual or four-speed auto trans (auto only in the Verada). In 1994, the Starwagon people mover was also made available with the 3-litre 6G72. These are auto only. In the Japanese market, the early generation 6G engine was used in a similar spread of vehicles – with a couple of additions. The 1989 model year Galant Sigma and Eterna Sigma (recognisable as the first generation Magna) were equipped with two different 6G engines. Entry-level models are powered by a 6G711 using a small 74.7mm bore and 76mm stroke for a displacement of 2-litres. With an 8.9:1 compression ratio, this engine generates just 77kW/158Nm. The same engine was also used in base versions of the Debonair. However, upmarket ‘Duke’ versions of the Eterna Sigma carry the bigger 3-litre 6G72 V6 which makes a much healthier 110kW at 5000 rpm and 230Nm at a low 2500 rpm. These engines come with an auto transmission only. Contemporary Japanese Pajeros use the same 110kW 6G72 as found in the top-line Eterna Sigma and come with the availability of a manual gearbox. The upper-spec 1989 Debonair saloon shares the same engine but delivers an extra 4kW and 5Nm (probably thanks to its revised intake manifold arrangement and different exhaust). Finally, the ’93 Diamante wagon and top-spec Debonair were sold with a 10:1 compression version of the 3-litre 6G72 3-litre V6. This engine makes 125kW on premium unleaded (curiously, the same as the normal unleaded slurping Australian-spec version). 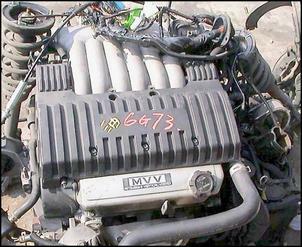 Japanese market 6G V6s received multi-valve DOHC breathing as early as 1990. The top-of-the-range late ‘90 Sigma (recognisable as the second generation Magna), Debonair saloon and GTO coupe all boast a DOHC multi-valve version of the 3-litre 6G72. This engine’s 10:1 compression ratio requires the use of premium unleaded fuel and output is 154kW in the Sigma/Debonair and 165kW in the GTO. These engines are available to suit front and rear-wheel-drive and come with a choice of manual or auto transmission. A slightly smaller 2.5-litre version was fitted to mid-spec late 1990 Sigmas. This 6G73 engine employs a 83.5mm bore and 76mm stroke crowned with DOHC, four-valve-per-cylinder heads and a 10:1 compression ratio that requires a diet of premium unleaded fuel. Max output is 129kW at 6000 rpm and 222Nm at 4500 rpm. Most examples are fitted with an automatic transmission but there are some five-speed manual versions to be found. A ‘big banger’ 3.5-litre 6G – the 6G74 – was released in 1992 using larger bore and stroke dimensions compared to the 3-litre. The 3.5 is otherwise the same and, in the ’92 Debonair, it outputs an impressive 191kW at 6000 rpm. Premium unleaded fuel is necessary to cope with the 10:1 compression ratio. The same engine – though engineered for longitudinal mounting - was then released in the ’93 Pajero and makes 169kW. 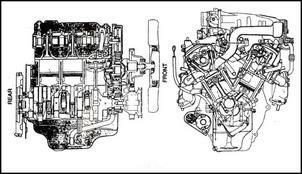 There was also a DOHC version of the 2-litre 6G71 but, in the context of these other engines, it’s almost irrelevant. The biggest news through the early ‘90s was the release of the Mitsubishi GTO with its twin-turbo 3-litre V6. Based on the DOHC 6G72, this engine has a reduced compression ratio (8:1) to accommodate the boost pressure from twin turbochargers and twin air-to-air intercoolers. The official output is 206kW (the Japanese power limit) at 6000 rpm and 427Nm at just 2500 rpm. This remains one of the gruntiest V6s out of Japan. 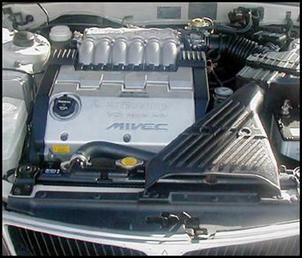 MIVEC technology was also applied to the 3-litre 6G72 V6 found in the 1995 Diamante. In the Diamante 30M, the MIVEC V6 puts out 199kW at 7000 rpm and 301Nm at 4500 rpm. Its 10:1 compression ratio requires using premium unleaded fuel. Unfortunately, this engine lasted only two years. 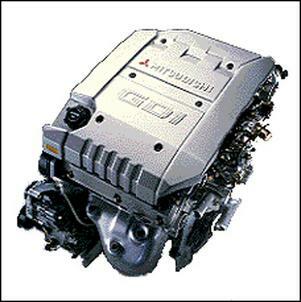 Interestingly, Mitsubishi also released a multi-valve but SOHC version of the 6G72 3-litre V6. In the Japanese market, these SOHC 24-valve engines are reserved for the 1994 Delica, 1996 Challenger 4 x 4 and Diamante wagon. Output is 136kW in the Delica and Challenger while the Diamante wagon delivers 147kW through a standard auto transmission. So what has the Australian market seen since the early ‘90s? Well, in late 1992, Australia received limited numbers of the GTO which were rebadged as 3000GT. 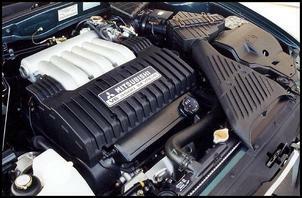 This was the first multi-valve Mitsubishi V6 to arrive in the country. It appears there were no major tuning changes from the Japanese version (despite the limited availability of ultra high-octane fuel) and quoted output is 210kW and 407Nm. Local sales of the 3000GT trickled through until it was axed in 1997. 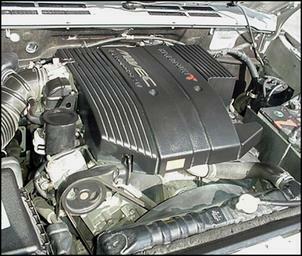 Next, Australia saw a multi-valve (but only SOHC) version of the 6G72 3-litre V6 in the 1996 third generation Magna. 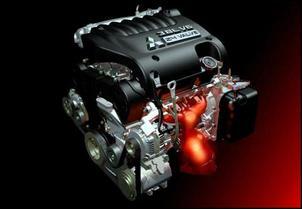 With its multi-valve breathing and 9:1 compression ratio, this engine outputs 140kW at 5500 rpm and 255Nm at 4500 rpm. A five-speed manual or four-speed auto was offered and sales continued until 2002. 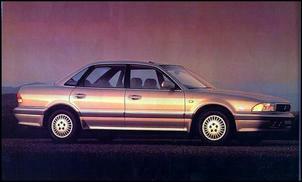 The big banger 6G – the 3.5-litre 6G74 – appeared in the ’96 Verada and, later, the 1999 Magna. The extra 0.5 litre capacity gives a bonus 7kW and generous torque in these early versions but revised cam specs improved power to 150kW during 2000. Further revisions elevated the base 3.5 to 155kW during 2001. 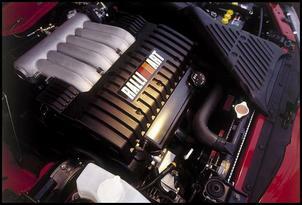 A high-performance version of the 3.5 (boasting a free-flow exhaust) was introduced in the 2000 magna Sports and VR-X. Output is 163kW. 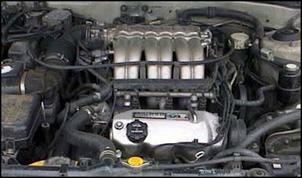 But the ultimate version of the local SOHC 3.5-litre can be found in the Ralliart Magna which was released in 2002. With hot cams, head work, a slightly higher compression ratio, headers and engine management changes you’re talking 180kW with no sacrifice in useable torque. Despite the absence of variable cam timing or a variable inlet manifold, this remains one of our favourite engines. Today, the 3-litre and 3.5-litre 6G engines have been replaced by a locally developed 3.8-litre 6G75. The 6G75 employs a 95mm bore and 90mm stroke (both bigger than the 3.5), multi-valve SOHC heads, a 10:1 compression ratio and the latest Bosch engine management. Maximum output is 175kW at 5250 rpm and 343Nm at 4000 rpm. A direct injection version of the 6G V6 was introduced to several upmarket Japanese-spec Mitsubishis during the late ‘90s. The 1997 Diamante uses a 6G72 3-litre DOHC engine with a 10:1 compression ratio and Gasoline Direct Injection (GDI) technology. Output is 176kW at 5750 rpm and 304Nm at 3500 rpm on premium unleaded. These engines are fitted with an auto transmission and AWD is available. A GDI 3-litre was also fitted to the ’99 Chariot Grandis but with a 10.5:1 compression ratio its output is reduced to 158kW/299Nm. 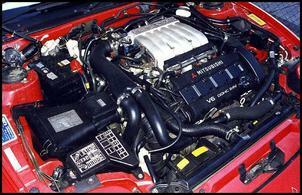 The biggest capacity GDI engine was installed in the 1997 Challenger and Pajero 4 x 4. 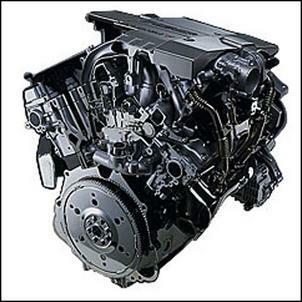 With the 6G74 3.5-litre V6 as the base, this engine runs DOHC heads, a 10.4:1 compression ratio and direct injection. The result is an impressive 180kW at 5500 rpm and 343Nm at 4500 rpm. Curiously, the post ’99 Pajero is detuned to just 162kW/348Nm. As you’ve probably worked out, you can achieve an awesome result by mixing and matching 6G engine family parts. Piece together custom combination with a large swept capacity, MIVEC, GDI and twin-turbochargers and you’d have something pretty special!